Arosfa Emlyn is a really good choice for those looking to book a holiday to spend with friends. Arosfa Emlyn can be found on the edge of the market town of Newcastle Emlyn, which is in Carmarthenshire, and sleeps 10 people. There are 5 bedrooms at Arosfa Emlyn, with the bedrooms being made up of 4 double bedrooms and a twin bedroom. The 4 double bedrooms are all en suite. All the bedrooms each have their own TV too - so there shouldn't be any arguments about whether to watch football or East Enders! Arosfa Emlyn has oil central heating. Your bed linen and towels are also included in the cost of your holiday. There are plenty of TVs, and some DVD players too. Arosfa Emlyn has an iPod dock, radio and CD player. With Wi-Fi also being available. A washing machine, dish washer and microwave are also provided. And Arosfa Emlyn has a games room - which includes a pool table and dart board. There is a large lawned garden, with a patio, furniture and barbeque - so perfect for a summers' evening in the garden. Just up the road is the Gwesty Emlyn Hotel, which has a range of facilities which are free for you to use during your holiday at Arosfa Emlyn. An indoor heated swimming pool with changing and shower facilities, hot tub, sauna and gym are all available at the hotel. The nearest pub and shop are 500 yards away from Arosfa Emlyn. The coastal towns of New Quay and Aberaeron are a short drive away. Or visit some of Carmarthenshires historical sites, such as Dinefwr Heritage Park and Aberglasney Gardens. For some outdoor activities, how about heading to the Pembrokeshire Coast National Park, whichere you'll find kayaking, sailing, windsurfing, surfing, diving, mountain biking, walking, swimming and climbing all on offer. For those who fancy a holiday at Arosfa Emlyn, holidays start on a Friday. Short breaks are also available, so you can get away for a weekend too. 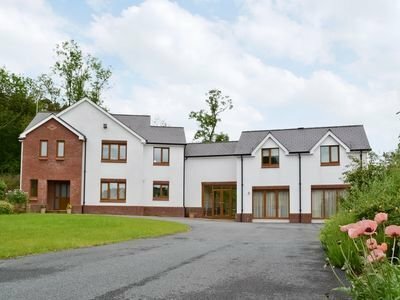 Should Arosfa Emlyn not be to your liking, but you fancy staying in the area around Carmarthenshire, you might well be interested in the cottages below. All these cottages are within a few miles of Arosfa Emlyn.